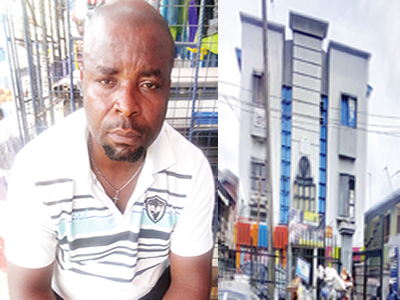 A father of four, Mr. Obinna Dike, broke down and wept as he recounted how a microfinance bank disappeared with his money, New Telegraph reports. Dike said he opened that account with the bank just to save money for his children school fees. Today, all the money is gone and the bank staff nowhere to be seen. The businessman, who deals on vehicle spare parts, said that he was ashamed that his wonderful kids couldn’t go to school as his money was trapped in Aguda Titun Microfinance Bank Limited, Olodi Apapa branch, Lagos State. According to him, as if the situation was not bad enough, the bank is now allegedly accusing him of destroying one of their computers, which, they said, was equivalent to his money that is with them. Dike said: “It was one of my customers that introduced the microfinance bank to me last year. The customer said it was a very good bank. I opened the account with N2,000 last November and since then; I have been saving N2,000 every day for my children school fees. I thought it would be easy for me to pay their school fees ones they resumed. But things didn’t go as planned. “When it was time to pay school fees, I went to the bank and discovered there was a problem. I couldn’t get my money. I went to the bank and they told me that there was no money. I had been able to save up to N150,000 and my kids’ school fees are N180,000. “I want to the bank to get my N150,000, and to get money somewhere and balanced it for the children’s school fees. Four of my children are now at home, after being driven away from school for not paying their fees. The school has been patient enough with me. I kept promising them, hoping that I would get the money from the bank. I cannot pay the school fees; the bank keeps dribbling other customers and I.
Dike noted that sick and tired of going to the bank every day, and after several efforts to get the management of the bank, he and other customers reported to Trinity Police Station, Olodi Apapa. He said: “I was very annoyed with the attitude of the bank staff and management. They were not coming to the bank and when they do, they would close their office’s door. They didn’t want anyone to know they were indoors. Customers would be waiting for them. I sincerely believe they are hiding from us. They owe us an explanation. We need to know what happened to our money. “Even the police that we alerted have not helped the matter. We thought by now, we would have been able get our money from the bank. Although the police arrested some of the staff and my account officer, but nothing fruitful has been achieved. My account officer and others were bailed the following day. Police told me that the bank has written an undertaken on how it would refund our money. “On the first appointment, they gave us a date to come and get our money. I went there and they gave me N40,000, to balance N110,000. They said that I should come for the balance, and I went on the agreed date. They told me that the management had written another undertaken on how my money would be balanced, which was March 10. I still went there on that date, but still nothing happened. “One day, I went to check on the bank and I noticed that the office door was opened. I quickly called the police; a policewoman was sent. One of the bank staff we met that day resisted arrest, forcing the policewoman to return to the police station for a backup. I advised the bank worker to follow the policewoman, but he refused and called his boss. He told the boss that I had destroyed their computer. Dike appealed to regulatory bodies in charge of microfinance banks to come to their aid and assist them to get their money. The state Police Public Relations Officer (PPRO), SP Chike Oti, said that police were already on the matter.